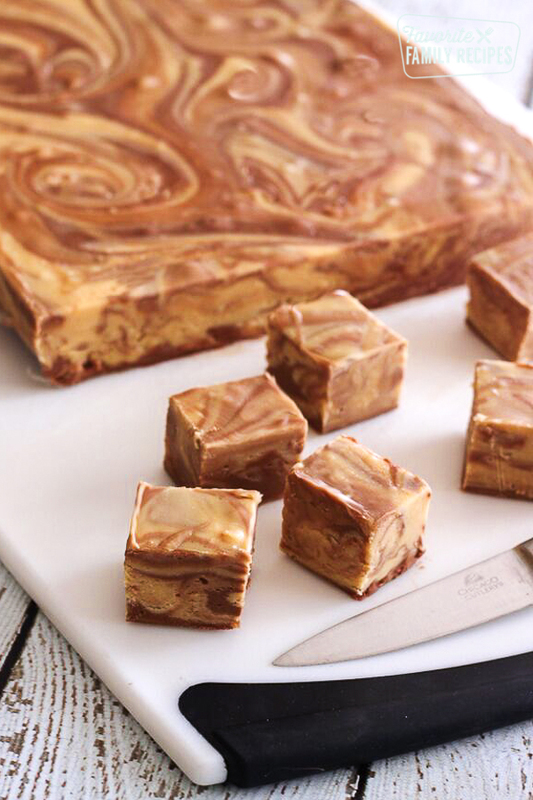 This Chocolate Peanut Butter Fudge swirl is quite possibly heaven on earth. Think Reese’s Peanut Butter Cup in fudge form. At first glance, I know this looks like a complicated recipe but it is actually SUPER easy. 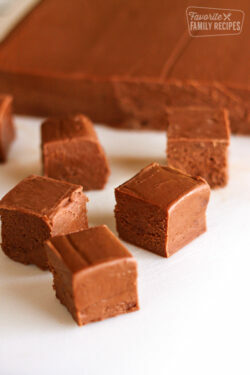 This is a variation of our See’s Fudge Recipe, HERE. 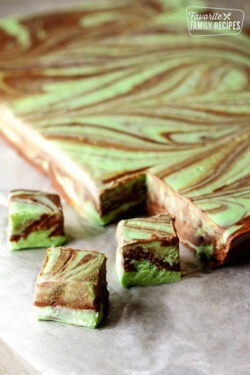 If you prefer mint over peanut butter in your fudge, see our Mint Chocolate Fudge Swirl Recipe. 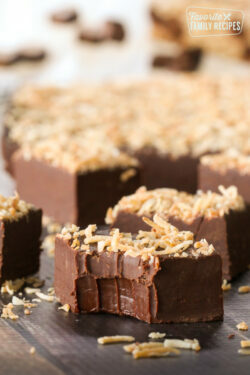 This chocolate peanut butter fudge can be made in less than 20 minutes! It is a simple, foolproof recipe that is smooth, creamy and perfect all-around. Being a big peanut butter & chocolate lover I have to say I actually like this recipe slightly more than just the plain chocolate recipe–but that is just me. In my opinion, chocolate and peanut butter were just meant to be together. This is the perfect Fall or Holiday recipe that is guaranteed to “wow” your guests. People will think you spent way more time on it than you actually did– plus it is so pretty! You can’t go wrong making this and taking it to the neighbors over the holidays– you will definitely be the favorite on the block! This Chocolate Peanut Butter Fudge Swirl is so easy to make and incredibly creamy and delicious! Tastes like a Reese's Peanut butter cup in fudge form. In a large mixing bowl, combine milk chocolate bar pieces, semi-sweet chocolate chips, 4 Tbsp. butter, and half of the marshmallow whip. Set aside. In a separate large mixing bowl, combine white chocolate bar pieces, peanut butter chips, 4 Tbsp. butter and remaining marshmallow whip. Set aside. Pour about a cup of cooked mixture into each bowl of chocolate at a time, stirring as constantly as you can for each bowl (you might want a helper for this part). Try to divide the cooked mixture between the two bowls as evenly as you can. Stir each bowl until all chocolate is melted and smooth. Pour about 1/3 of each type of fudge at a time into a greased 9x13 glass baking dish. 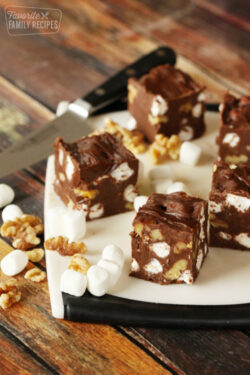 Using a knife, swirl the two types of fudge together to make a pretty, swirled design. Cover tightly and refrigerate until hardened (several hours or overnight). Q. Can I use Marshmallows instead of marshmallow fluff? A. In a word… no. We have had readers try it and they say it doesn’t turn out right. We haven’t tried it before (if it ain’t broke…) but I can tell you it won’t be the same. We have had some say that they have melted marshmallows down or used a recipe to actually make marshmallow fluff but again, we haven’t tried this so we can’t tell you for sure that it will work. We like to keep things simple and always stick to this original recipe. Q. This has a lot of sugar… is there a way to cut back? A. We don’t recommend using less sugar or using sugar substitutes for this recipe. It just won’t set up the way it is supposed to. If you are trying to cut back on sugar I suggest maybe just cutting yourself a smaller piece (if you have that kind of self control)? What kind of white candy bar and where do you find them? I found a plain white chocolate at the grocery store with the regular candy bars. I don’t remember what brand it was. Next time I go to the store I will double-check and include it here on the recipe. Any brand of white chocolate will work though! DOVE , find them Walmart, Kroger any supermarket…candy bar aisle. The hardest part is the wait! haha excited for you to try it! Thanks for the yummy recipe.What can i use instead of marshmallow fluff ? Can i melt marshmallows? You can sure try it– haven’t done it with actual marshmallows before so if you try it, let us know how it turns out! I guess I am old fashioned, any ‘fudge’ recipe that calls for chocolate chips, marshmallow fluff, and a Hershey bar, is not real FUDGE. I make my fudge using the recipe on the can of Hershey cocoa. You use milk, butter, cocoa, sugar, vanilla and a pinch of salt, peanut butter and lots of love and patience. That is how real ‘fudge’ is made. This is a different type of fudge than old fashioned but its still fudge. I think its better, creamier, and not as sweet. Its the type I use and I sell it in my local area. I have made both “true” old fashioned as you describe and the kind with chocolate chips and marshmallow fluff and I absolutely prefer the marshmallow fluff fudge. My family and everyone I’ve made it for loves it. I love the texture and taste much better and I consider both to be “real” fudge. I’m excited to try this recipe! I’m in the uk…..i so want yo try this recipe but don’t know what peanut butter chips are. can anyone enlighten me…? We haven’t used brown sugar for this recipe before… I really don’t think it would turn out quite the same but you could try! If you do it, come back and let us know how it turns out! what size bag of chips 8ozor 12oz ? I want to gift this. Will this keep at room temp? Or does it have to be constantly cold? Do you really need 8 ounce Hershey bars? I found 1.55 oz bars?? Yep. If you do the smaller bars you will want to buy enough to equal 8 oz. what happens if I use white choc baking chips? The proportions on this should be correct. They are the exact measurements I used in the recipe. What size bag of semi sweet chips did you use? And what size peanut butter chips? Just your typical 12 oz bag.. for both. Hope this helps! Looks yummy! Just pinned it. I made this for the first time today. I was so excited because it looked so good. But mine did not set up (get hard). And I had way more peanut butter/white chocolate mixture than just the chocolate. What did I do wrong? I followed the instructions with the exception of I could not find a white choc candy bar so I used white choc chips. But I saw a question where someone asked about that and the reply said the chips should be fine only maybe not as creamy. I hate that it did’t turn out since it calls for so many ingredients. But I will try it again some day. Can anyone offer information as to my problems iwht it? It sounds like the white chocolate candy bar missing was the issue. The candy bars definitely set up best and have less of a grainy texture. It could have been that the chocolate fudge didn’t match the consistency of the PB fudge and for some reason it wouldn’t set up. Did you try refrigerating? Carolyn….I sure hope you didn’t throw away your “fudge” mixture! Can you just imagine how amazing it would be as a topping for ice cream….or cake….or pudding….or a graham cracker crust type of pie?!! YUM! Such a delicious mistake! HA! I’m so sorry it didn’t turn out– you definitely want to use white chocolate candy bars– it is expensive but it makes it oh so good! Would it be OK to use marshmallow creme? I think it is the same thing… ? How long will the fudge keep? Want to hand out at the holidays and am wondering how far in advance this can be made. I would say it stays really well for about 5-7 days… maybe longer if you keep it really air-tight and in the fridge. It has a tendency to dry out if left uncovered for too long. It’s not that it will go rancid or anything– it will just get dry (and dry fudge is not my favorite). An 8 oz Hershey bars? Bakers chocolate bars, whether white or milk chocolate are 4 oz, so you are saying to use 2 whole bars OF EACH? Yes, you need 8 ounces of milk chocolate (Hersheys Bar) and 8 oz of white chocolate (Bakers white chocolate will work great). Thanks for asking! I followed this recipe to a T. I don’t know what happened but it is soft and hard to cut because it is sticking to the knife. I am so upset and disappointed. It was way to expensive to just throw away. Ughhh. Does anyone know what happened. It does have a really good taste tho it’s just not the “fudge” I had in mind and definitely won’t be able to give as the gifts I was planning to. Have you tried putting it in the fridge? It definitely should have hardened up. I’m sorry but you don’t include the weight of the chocolate chips or peanut butter chips….that would be great! Hi Eileen, a package of semi-sweet chocolate chips is 12 ounces (or 1 1/2 cups), and a package of peanut butter chips is 10 ounces (about 1 1/3 cups). Thanks for asking! Loved this recipe!! My first time making fudge and I followed your directions step by step and it came out delicious! It was a huge hit with everyone!! Thank you :)! I am wondering if this could be frozen? We would not recommend freezing. Hope this helps! I don’t have a glass baking dish. Can I use a metal or coated baking pan? Yes, that should be fine, just make sure that you line with wax paper to avoid sticking 🙂 Hope this helps! Just to be sure I understand, are you layering the two different chocolate mixtures alternately 3 times each, all in the same pan? Thank you. This sounds wonderful for my church’s Christmas bazaar, and I don’t want to mess up! Does that say 17 jars of marshmallow fluff? No, sorry, it is 1 jar that is 7-8 oz. That is the typical jar size of the fluff. Hope this helps! It should yeild appx. 115 1″ squares when measured exactly. Probably closer to 100. It should make 13 rows of 9 squares but I usually cut them a little bigger. Can I use cream peanut butter instead of the peanut butter chips? You can try it but the consistency may not match with the chocolate fudge. If you try it let us know how it turns out! If I use chocolate chips, the “batter” for the fudge is lumpy. Does that mean that I should try to melt the chocolate chips before I add the evaporated milk? They should melt once you pour the hot milk in. You can try melting the chocolate chips over a double boiler first, but it isn’t necessary. Are you using marshmallows or marshmallow cream (fluff)? I’ve got a couple of questions, as I want this recipe to work for me. I have to say upfront that I am a former professional chef but pathologically incapable of following any recipe as is. The idea of adding such a highly processed ingredient such as marshmallow fluff is anathema to me. What if I were to substitute a Swiss or Italian meringue instead? I realize that you may not be familiar with either of these techniques, but would appreciate any feedback you have. Could you at least give me a ballpark estimate of how much meringue I would need to fluff up the recipe? Since meringue isn’t as thick as marshmallow whip, I would try a 1:1.5 ratio maybe.. but even then, I don’t know if it will set as well as the whip because the consistencies are different. I feel like the meringue would be absorbed too much. You can always experiment! Sorry I’m not much help on this! I know there are recipes online for homemade marshmallow whip, that may be a better way to go? The peanut butter chips and chocolate chips range from 10-12 oz. per package– either size is fine. Hope this helps! I’m in the UK. What is 1 stick of butter in grams and what us a pkg please; if it means package what is the weight? 1 stick = 1/2 cup. for the packages in this recipe, they are 10-12 oz. per package. Hope this helps! Can I use merckens milk chocolate wafers instead of Hershey’s candy bars? We haven’t tried that variation, so I can’t speak to how it would affect the taste or texture. I’ve made this recipe twice and I’m not sure what is going wrong. I followed the directions as described and both the white fudge and chocolate fudge ended up being very thick after mixing with the evaporated milk mixture. It was so thick that it was difficult to blend the two fudges together. Any suggestions? It should be fairly thick- you should be able to swirl it right when you put it in the pan. If you wait too long before swirling it will be difficult to swirl. Has it already set up? Did it end up working out in the end?